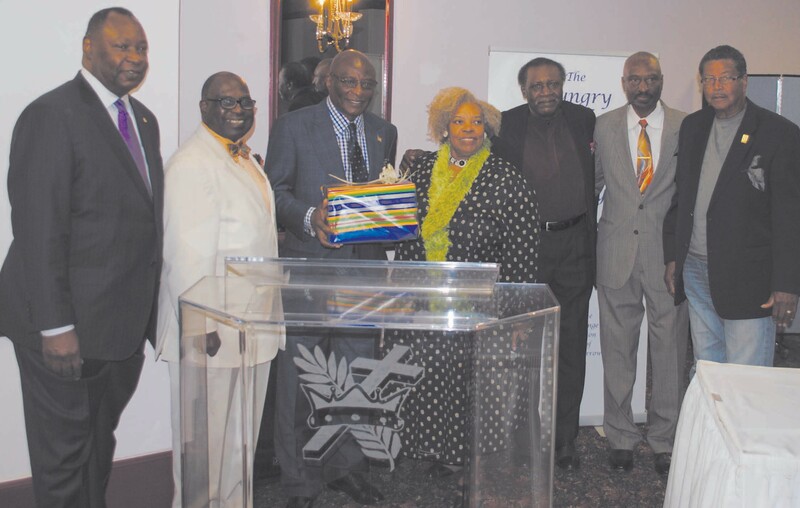 L to R: Robert James, Bishop Willie Ferrell, Cornell McBride, Sr., Diana Harvey Johnson, Elliott “Booster” Simmons, Eddie McBride and Chester Dunham. Cornell McBride, Sr., CEO of McBride Research Laboratories, Inc., was the keynote speaker at the 10th Annual Community Service Appreciation Luncheon of The Hungry Club Forum of Savannah, Inc. (HCFS). The event was held on Saturday, May 7, 2016, in the Banquet Center of the Temple of Glory. 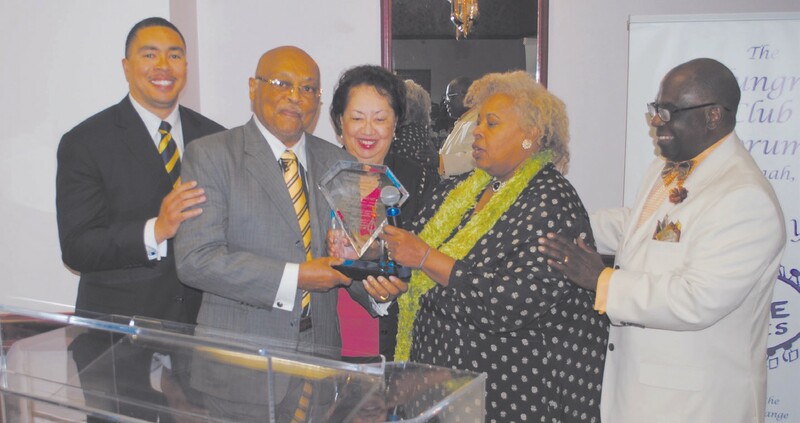 The coveted 2016 Washington Walker Community Service Appreciation Award was presented to the family of Charles and Joenelle Brown Gordon in recognition of their business accomplishments and contributions to the uplifting of the Savannah community. Bishop Willie Ferrell, HCFS President and Pastor of Royal Church of Christ, served as Master of Ceremony for the inspiring luncheon program. HCFS Vice President Bobby L. Adams and Carver State Bank President Robert James gave greetings. Music for the event was provided by Elliott Simmons and Lisa Overton. Rev. William Thomas, Pastor of Greater Gaines Chapel AME Church, offered prayer. The speaker was co-introduced by Kenneth Adams, Editor of The Herald of Savannah and Eddie McBride, one of his brothers. Diana Harvey Johnson, founder of The Hungry Club Forum, presented the Washington Walker Award. L to R: J. Craig Gordon, Charles Gordon, Joenelle Gordon, Diana Harvey Johnson and Bishop Willie Ferrell. He listed his core principles that include values such as hard work, ethical behavior, determination and treating others fairly. McBride’s first company, M&M Products Company, was established in 1970 by McBride and his college friend Thurman McKenzie. M&M Products, maker of Sta-Sof-Fro, was sold to Johnson Products in 1990. The second multi-million dollar company, McBride Research Laboratories, located in Decatur, Georgia, markets and distributes a private line of hair-care products sold in the United States, the Caribbean, Europe and Africa. The flagship brand is Design Essentials.